David Fernandez was "shocked" and "in disbelief" by what he saw Friday morning while driving through Monrovia, California. Across the street, roaming a home's yard, was a buck with an arrow lodged through its neck. The buck was not bleeding but appeared to have trouble walking, Fernandez said. When Fernandez called the Department of Fish and Wildlife, they told him that the animal had actually been wandering in the area for "three to four days," he said. 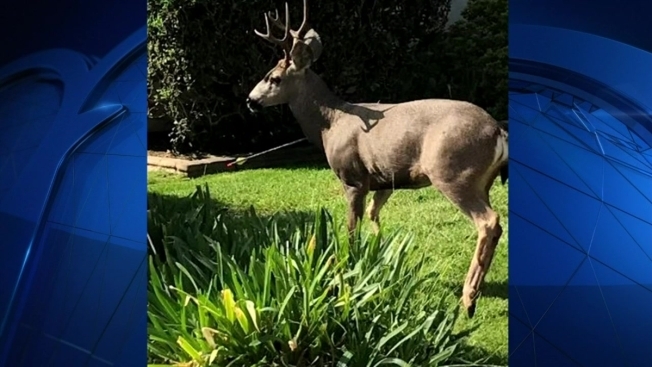 Fernandez, 47, who has been living in Monrovia, located in the foothills of the San Gabriel Mountains, for the past five years, said he's no stranger to wildlife in his neighborhood. He said he has seen dozens of deer in his backyard, and has even spotted bears roaming around his property. Seeing the buck running around with an arrow puncturing its neck, however, was surprising, even for him. "I had to take a second look," Fernandez said. Neighbors love the animals in the area, he said. "The animals become their family and friends." Because of that, they are "horrified" at the buck's plight and are starting a GoFundMe page to raise money for whoever captures the animal or gives information on the person who shot it. Fernandez said that Fish and Wildlife officials told him the hunt may be legal. While shooting animals in residential neighborhoods is illegal, the buck may have been shot miles away in the wilderness before making its way in to the community. Fish and Wildlife officials plans to treat the animal and release it back into the wild, Fernandez said. The department was not immediately available for comment.